This is the first post in a series to shake up our intuitions about what machine learning is making possible in specific sectors—to look beyond the use cases that always come to mind. Machine learning has already extended into so many aspects of daily life that it can be handy for us to memorize a set of go-to examples of its impact on certain industries. For instance, we might think of fraud detection as the canonical example of machine learning in the financial sector. Or we might think of Watson's cognitive approach to oncology as the canonical example of machine learning in healthcare. Or, yet again, we might point to recommendation engines at Netflix and Amazon as canonical examples of machine learning in retail. Certainly, those are tremendous demonstrations of the power of the technology — and in aggregate, they give a sense of machine learning's pervasive presence in our lives. But the convenience of go-to examples might come at a cost. In particular, citing the same handy examples might keep us from noticing the wide diversity of machine learning use cases within individual sectors. 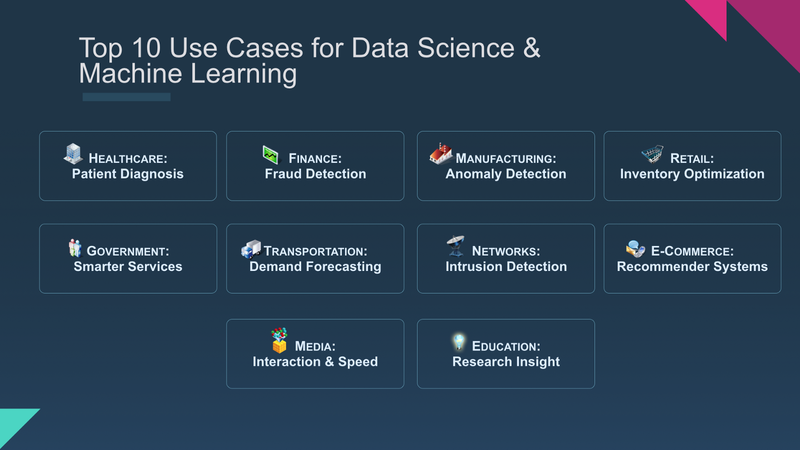 This post is the first in a series whose aim is to shake up our intuitions about what machine learning is making possible in specific sectors: to look beyond the set of use cases that always come to mind. As much as any commercial sector, government is under constant pressure to do more with less, to serve more constituents more effectively and more intelligently. That includes agencies tasked with environmental protection like the DCMR Milieudienst Rijnmond, which battles pollution, waste, and other environmental threats for the region surrounding Rotterdam in the Netherlands. By combining various IBM Analytics software, a strong partnership with the Dutch security firm DataExpert, and a suite of remote sensors, the team could use machine learning to help identify and evaluate environmental hazards in real-time — and can sort the hazards by severity and urgency. By detecting and assessing environmental threats algorithmically, the system can identify key risks and lack of compliance. Automating and improving that aspect of their work can give the DCMR more time and energy for other actions that could boost public safety. In the same corner of Europe, an employment and vocational agency called VDAB is striving to give workers in Belgium's Flanders region the information and resources they need to find and keep work. Thankfully, unemployment in Belgium is falling — from 8.2% to 6.8% in the last year — but even at 6.8%, there's clearly more work to do. One of the agency's key goals is reducing the duration of unemployment for young workers while finding ways to direct limited resources where they're truly needed. The machine learning solution: an ML model crafted by IBM Global Business Services that crunches past data to predict the duration of unemployment for each job seeker. By focusing attention on the young Belgians most at risk, the agency can do more to interrupt the patterns of joblessness and kick off self-reinforcing steps toward job security: a long-term boon to the economy at large. Halfway around the world, we find the Instituto Colombiano de Bienestar Familiar, a children and family welfare organization working nationwide in Colombia for the prevention and protection of early childhood, childhood, adolescence and the welfare of families. On a tight budget, the organization still manages to reach more than eight million Colombians with its programs and services. Among those eight million, 38,730 in 2016 were malnourished children who received 29,552 emergency food rations and more than five million dietary supplements. That work didn't happen by accident. Behind the scenes, the analytics firm Infórmese used IBM SPSS Modeler to provide predictive analytics and micro-targeting capabilities that optimize the distribution of aid to Colombia's poorest and most remote areas. Governments and their agencies across the world are using machine learning at the national and local level to do more than process tax returns or make the buses run on time. Let's put these three new examples in our tool belts as we continue to advocate for machine learning - and as we look for new ways to bring its capabilities to bear.